Guests will be entertained as they watch this skilled artist at work. 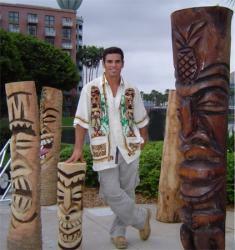 Be amazed as our costumed tiki carver turns a swamp palm tree trunk into a work of art. Several completed tiki carvings will surround the artist to add that extra touch. Please note lighting and a 12′ x 12′ flat, hard surface are required.